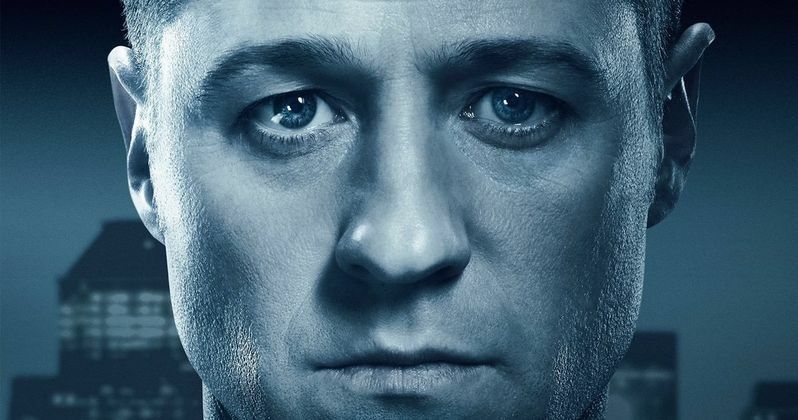 Since it's been a few months since Gotham's Season 3 Comic-Con trailer debuted, Fox decided to roll out a new trailer giving us a glimpse at the "new" Jim Gordon (Ben McKenzie). Since Jim is no longer a member of the GCPD, and he's no longer seeing Dr. Leslie Thompkins (Morena Baccarin), he can now do whatever he wants. He also reveals that his work as a bounty hunter pays well, leaving it up to someone else to serve and protect in this new season, which is dubbed "Mad City." Season 3 will peel back the curtain on the infamous criminal organization known as the Court of The Owls. With the Indian Hill escapees on the loose, Jim Gordon (Ben McKenzie) must take matters into his own hands as a bounty hunter in Gotham. He makes it his mission to find Hugo Strange (guest star BD Wong), the mastermind behind the horrifying Indian Hill experiments, and Fish Mooney (guest star Jada Pinkett Smith), one of Strange's subjects. Meanwhile, GCPD Detective Harvey Bullock (Donal Logue) and Captain Nathaniel Barnes (Michael Chiklis) remain at the forefront of the fight against crime in the monster-ridden city. Also, Bruce Wayne (David Mazouz), with the help of his trusted butler and mentor, Alfred Pennyworth (Sean Pertwee), and former Wayne Enterprises employee, Lucius Fox (Chris Chalk), discovers there are still more secrets to uncover regarding his parents' murders in Gotham Season 3. As the city sinks deeper into chaos, Gotham will continue to follow the evolving stories of the city's most malevolent villains: The Penguin (Robin Lord Taylor); Edward Nygma/the future Riddler (Cory Michael Smith); Selina Kyle/the future Catwoman (Camren Bicondova); Barbara Kean (Erin Richards), Tabitha Galivan/Tigress (Jessica Lucas) and Butch Gilzean (Drew Powell). Gotham Season Three also will catch up with the future Poison Ivy (Maggie Geha), who, after an encounter with a monster from Indian Hill, finds herself reborn as a young woman who's harnessed the full power of her charms; and will dive into the origin stories of Jervis Tetch/Mad Hatter (Benedict Samuel), a talented hypnotist teetering on the edge of madness; and the Tweed Brothers. Gotham stars Ben McKenzie as Detective James Gordon, Donal Logue as Harvey Bullock, Michael Chiklis as Detective Nathaniel Barnes, Sean Pertwee as Alfred, Robin Lord Taylor as Oswald Cobblepot/The Penguin, Erin Richards as Barbara Kean, David Mazouz as Bruce Wayne, Camren Bicondova as Selina Kyle/the future Catwoman, Cory Michael Smith as Edward nygma/the future Riddler, Chris Chalk as Lucius Fox, and Jamie Chung as Valerie Vale, the aunt of future Batman love interest Vicki Vale. Gotham will air its Season 3 premiere Monday, September 19 at 8 PM ET on Fox. Take a look at the new trailer below, courtesy of Fox, and stay tuned for more on Gotham.